Access to the data entry page is provided by the NCSI Data Manager. Ultimately, all criteria can be assessed YES / NO. Evidence materials must be added to receive a positive score for any criterion. A contributor is a person assigned in a country as a contact person for data collection and entry. The contributor is responsible for the accuracy of the data and must be ready to provide clarifications, if needed. For general matters, please contact the NCSI Project Manager Ms Epp Maaten at epp.maaten@ega.ee or +372 5301 1120. For data management, please contact the NCSI Data Manager Ms Marit Lani at marit.lani@ega.ee or +372 5656 8420. To receive a positive score for any criteria, evidence material must be provided. All data must be entered in the dedicated section of the NCSI website at https://a.ncsi.ega.ee. Access to the data entry environment is given to the contributors by the NCSI Data Manager. 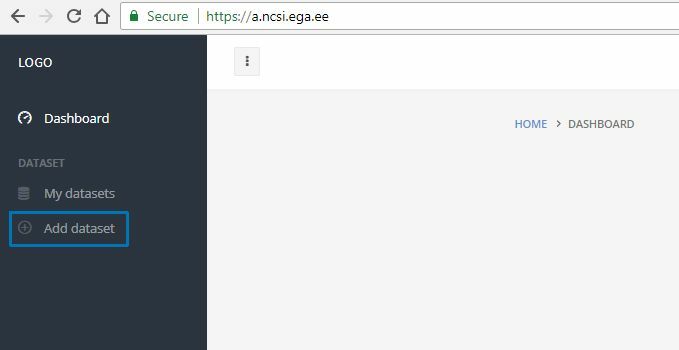 Please use your email address and the password provided by the NCSI Data Manager to log in at https://a.ncsi.ega.ee. As a first step, please click on “Add dataset” in the left-hand menu. 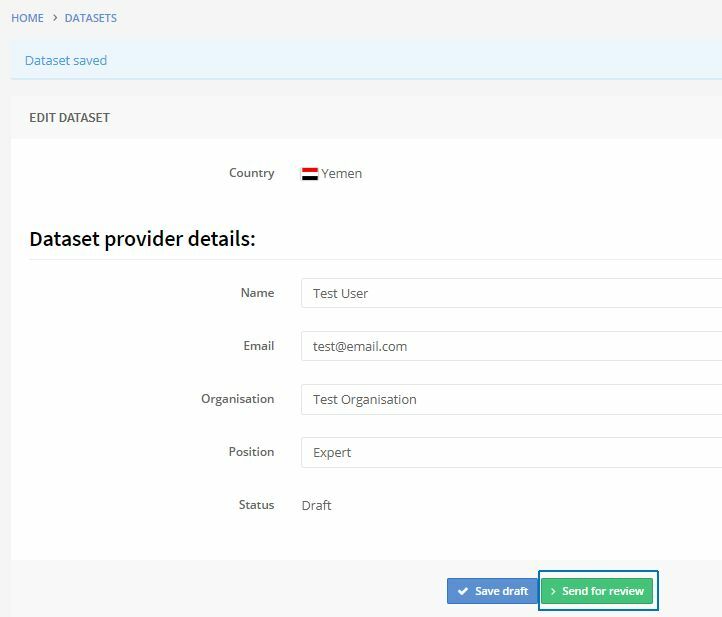 By clicking on “Add dataset”, the page will automatically create a new dataset for your country. Please fill in the information about the data contributor in the first section and proceed to the indicators. Please note that although it is possible for a country to have more than one contributor, they cannot work on the same dataset. Each user can only access datasets they have created. Therefore, if several people need to work on the same dataset, we advise that you share the login and password. Data has to be collected according to the methodology of the NCSI. The criteria for each indicator are presented in the data entry section of the NCSI website. Please note that if the data provided does not meet all aspects of the criteria, it will not be accepted as sufficient evidence material. All evidence material has to be in English, in order to be verifiable by NCSI experts. If the evidence material is not in English, the contributor must translate essential parts of the evidence to correct and understandable English. The translation should be inserted in the comments box below the web link. All evidence materials have to be public information and publicly accessible. Only official data can be considered as evidence material. Opinions, studies, news articles, reviews, etc. are generally not accepted as evidence materials. The types of accepted evidence for each indicator are described in the data entry section of the NCSI website. It is possible to add up to three evidence web links (with comments) for each indicator. If the evidence material/reference is a web link, it should be the most direct and accurate link. Please make sure that all links start with http:// or https://, otherwise an error message will appear. It is necessary to indicate in the comments box below the web link, where the specific evidence material can be found (page, paragraph, section, article, etc.). Please note that if the provided evidence/references do not comply with the accepted references, these will not be accepted as sufficient evidence. It is possible to save the draft dataset at any time, to continue working on it later. After the dataset has been created and saved, it will be accessible in the “My datasets” section in the left-hand menu. Once the data entry is finalised and the dataset is saved, please click on “Send for review” to forward it to the NCSI experts for review. If the contributor is working with a country that already exists in the index, the procedure to be followed is the same. However, all of the current approved information in the index (link, comments) will be presented at the relevant indicator, below the accepted evidence description (see Figure 5). The contributor can either change, add or remove information. If the information needs to be changed, please simply add a new web link to the “Web link 1” on the right hand side and, if needed, add description/comments in the box below. 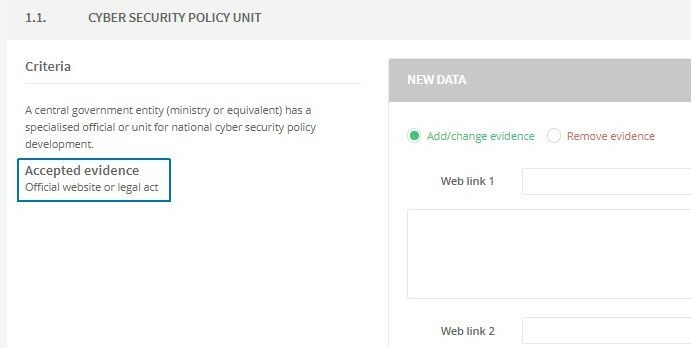 If the information in the index is still valid, but new information needs to be added, please copy the current evidence to the right hand side and add the new information under “Web link 2” or “Web link 3”. If current information needs to be removed from the index (e.g. 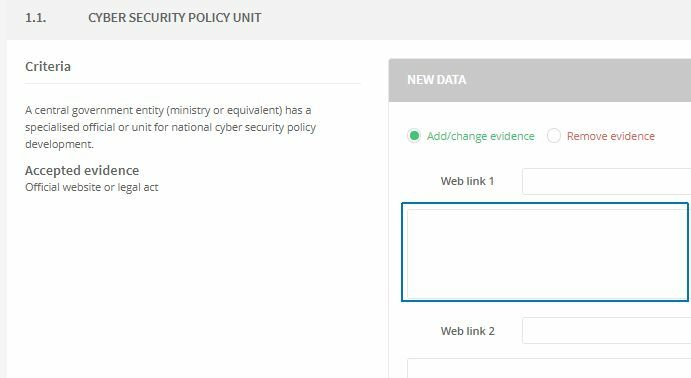 a link is outdated) so that the evidence is left blank, please select “Remove evidence” above Web link 1. If no changes need to be made to the evidence, please do not change or copy anything. All the information will be automatically kept in the index, if no changes are made.